Populations of whiteflies are “unusually high” in Georgia cotton fields this season, making early detection and management of whiteflies essential, according to University of Georgia entomologists Phillip Roberts and Stormy Sparks. When uncontrolled, whiteflies can reduce cotton yields and affect cotton quality. Whiteflies are sucking insects that feed similarly to aphids. When they feed on a plant, they excrete a sugary substance called “honeydew,” which serves as a host for the sooty mold fungus. The accumulation of honeydew and sooty mold leads to quality problems on open cotton bolls. “We also see plant stress and leaf decline, which can lead to premature defoliation. Whiteflies can have a negative impact on both yield and fiber quality,” Roberts said. Cotton fields with previous whitefly issues are especially at risk and prone to experiencing greater infestation. Compared to last year, when whiteflies were also a problem, this year’s infestations are being observed at much higher numbers. Many chemical control methods for whiteflies exist, but all are most effective against whiteflies in their immature stages, Sparks said. “If you wait until you have large populations of whiteflies as adults, it is very difficult to catch up,” he said. Scouting leads to early detection and sets the framework for a management plan that may include populations of other insects, like stinkbugs and bollworms. Roberts discourages using insecticides that trigger whiteflies or make populations worse. “Scout all pests and minimize insecticide use, but when whiteflies trigger a spray, react in a timely manner,” he said. Whiteflies may be a greater problem this year due to the extremely mild winter, according to Sparks. While colder temperatures don’t eliminate whiteflies, they do kill many of their wild hosts and slow population development in cultivated hosts. Warmer temperatures allowed for larger whitefly populations to overwinter and become mobile earlier this summer. “Adding one or two generations of a pest can have staggering effects on population growth,” Sparks said. In the heat of the summer, whiteflies can grow by a generation in just two weeks. The developmental time for these insects is related to temperature. When temperatures are cooler, development takes longer. In temperatures of 90-plus degrees Fahrenheit, which are common in Georgia in July and August, development time for whiteflies decreases. 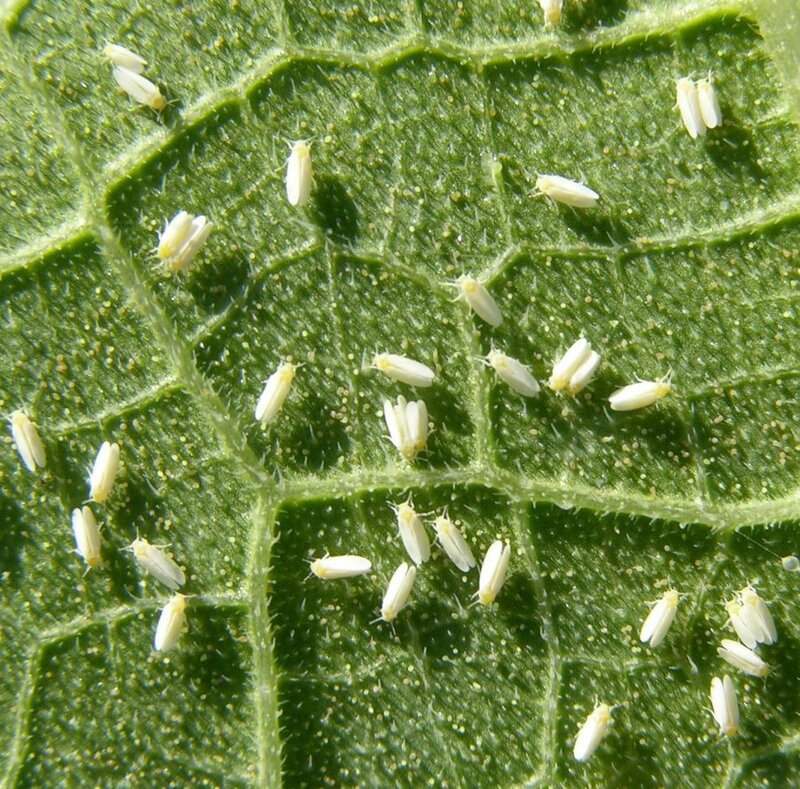 “Each female whitefly lays about 150 eggs in her lifetime, so populations can increase very rapidly,” Roberts said.